How GE's forthcoming 2019 outlook could change investor perception of the stock. General Electric (NYSE:GE) CEO Larry Culp didn't give specific guidance on his first earnings call at the end of October, and ever since then, the stock has been susceptible to attack from bears. The company is undoubtedly facing issues -- tax and insurance liabilities and investigations into its accounting by the Securities and Exchange Commission and the Department of Justice among them -- but most stocks have a price worth paying and it's hard not to think that the market has been overly pessimistic on GE.With this in mind, let's take a look at what GE could offer in terms of guidance for 2019 and whether it would make the stock attractive. Before getting to 2019, it's worth noting that management's refusal to give specific guidance for 2018 could indicate a desire to put all the bad news into the stock in the third and fourth quarters of 2018 -- something that would set up more positive-looking numbers in 2019. If so, then look out for another hit in the power segment in the fourth quarter as management might decide to take further restructuring charges and writedowns. GE is facing a better year in 2019. Image source: Getty Images. 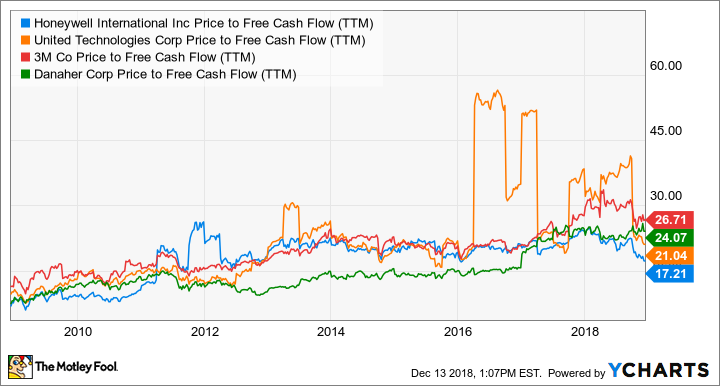 Turning to what to expect from GE in 2019, analyst earnings-per-share consensus is for $0.69 in 2018 to rise to $0.84 in 2019, and some are forecasting $4.4 billion in industrial free cash flow (FCF) in 2018 and around $4.7 billion in 2019 -- both EPS and FCF figures are for the current portfolio. As a reminder, GE is on track to separate GE Healthcare and merge GE Transportation with Wabtec, and the company will be structured around its power, aviation, and renewable energy businesses in the future. If Culp predicts the kind of industrial FCF figures given above, then the stock will start to look very cheap. For example, given its current market cap of around $63 billion, GE would trade on a forward price-to-FCF multiple of 13.4 times. That's notably cheaper than what its industrial peers trade for right now. However, don't worry too much about this because GE investors should receive a portion of the new GE Healthcare when it's spun off. In other words, you can't just look at the remaining company's FCF. Furthermore, Culp will, hopefully, do a good job of explaining that GE Aviation and GE Power are currently not generating anything like their potential FCF due to near-term constraints. Moreover, if you put the aviation and power segments FCF into context, GE's valuation looks even cheaper. GE Aviation is only set to convert 80% of its earnings into FCF in 2018, and its margin is also being held back by ramping production of loss-making LEAP aircraft engines. There were 459 LEAP units produced in 2017 and 1,150-1,200 are expected for 2018, with 1,850-1,900 expected in 2019 and 2,200 forecast for 2020. Of course, this isn't a problem because GE will generate high-margin revenue from aftermarket parts and services from LEAP in the coming years as the engines are put to use. But it also means that GE Aviation earnings and FCF in 2019 should be seen as temporarily suppressed and not reflective of the long-term potential of the segment. The power segment is also facing significant near-term earnings and FCF headwinds. While its far from clear that gas turbine demand isn't structurally challenged by increasing energy efficiency and renewable energy penetration, it's also fair to say that GE should be capable of at least generating mid-single digit margin in Power in the years to come -- in line with what Siemens is anticipating. Moreover, GE also has to deal with the issue of making earlier-than-expected blade turbine repairs, and according to Reuters GE has been actively fixing the problem in the fourth quarter. GE Power took a $240 million hit from warranty and maintenance reserves on the turbine blade issue and more charges are expected in the future. In addition, GE is in process of restructuring its power segment and is likely to take charges as a consequence. All of these issues add up to create significant near-term headwinds, but it's worth recalling that GE Power's earnings have been so weak in the last couple of years because, according to Morgan Stanley, GE has been heavily discounting its flagship HA turbine in order to generate aftermarket parts and service growth in the future. Putting all this together, if Culp sees, say, $4billion-$4.7 billion in industrial FCF for 2019, then the stock will look cheap. Power and aviation earnings/FCF are being suppressed due to a variety of factors and the market should factor this into valuations. The greatest imponderable is probably GE Capital and the various liabilities it faces -- for example, analysts are worried about GE's potential tax and insurance liabilities. Furthermore, given that GE has consistently overestimated end demand in power it's possible that the SEC will determine that GE previously booked more earnings than will actually come from its long-term service agreements in power -- fines/charges to come? However, with more color on the matter from management, much of the uncertainty (and there's a considerable amount) should dissipate. Whichever way it goes, GE looks set for a better 2019 than it had in 2018.